For years her spouse, Wes Guarino, had been the one leaving: two deployments to Iraq, another with a Marine Expeditionary Unit, another with a Marine Air-Ground Task Force. Four deployments between 2005 and 2016 over Wes' 23-year Marine Corps career and the couple's nearly two decades of marriage. Not to mention time away from home and family for training and readiness exercises. But this was the first time Wes, who's based at Marine Corps Air Station New River, had to watch someone leave. 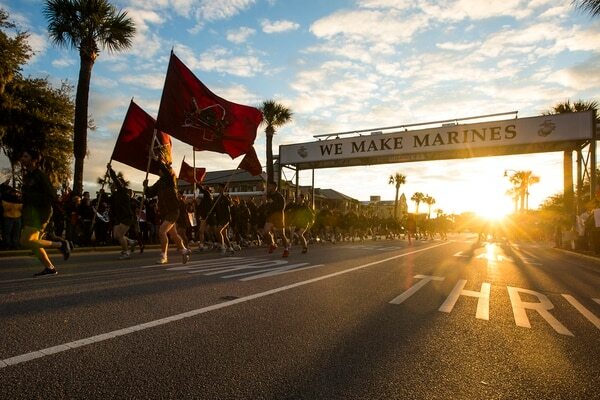 Every year, thousands of recruits do make it through to become Marines, which must be on the minds of those pictured below, who are a part of Echo Company, 2nd Recruit Battalion. His son, Charlie Guarino, was leaving Jacksonville, N.C., for the South Carolina Lowcountry, where he would, almost three months later, become a Marine. And the day before Charlie graduated boot camp, he'd have the rare opportunity to honor his father at a special ceremony, one that brought together three generations of Marines. It was an intimate moment, a proud occasion — a glimpse inside a military family and its definition of "normal." Charlie had a bit of a leg up when he entered boot camp in July. He knew the military lingo and a lot of the Corps' history. He knew to wear his "cover" — his hat — tilted forward, so it almost hid his eyes, not propped up on his head "like a baseball cap." He knew how to roll the sleeves on his camouflage blouse. In fact, Charlie said, his sleeve-rolling was so precise that it once frustrated a drill instructor. And he knew how to pin ribbons and decorations on a uniform. He credits his dad with teaching him these things — Wes finished Parris Island in 1995 — and growing up around Marine bases in California and North Carolina didn't hurt, either. "When I was 4, I wanted to join (the Marines) because I wanted to copy my dad," he said, remembering when Wes, a helicopter crew chief, took him to work on occasion and let him hang around the aircraft. Wes said his son once dressed up as a crew chief for Halloween. Charlie said his dad and others let him get some seat time in V-22 Osprey and CH-46 helicopter simulators when he was a fifth-grader — when he decided to break from his dad's path and work toward becoming a pilot. For Charlie, joining the Marine Corps became a "personal challenge" rather than a family tradition. Still, coming to Parris Island gave him a taste of what his father experienced during deployments. "It was interesting to be cut off from the world," Charlie said, "and to know what he was feeling." Charlie received a letter during training one week. The note informed him of Wes' impending promotion to Chief Warrant Officer 4 (CW04). The promotion was scheduled for early October, and plans were made to honor the occasion. 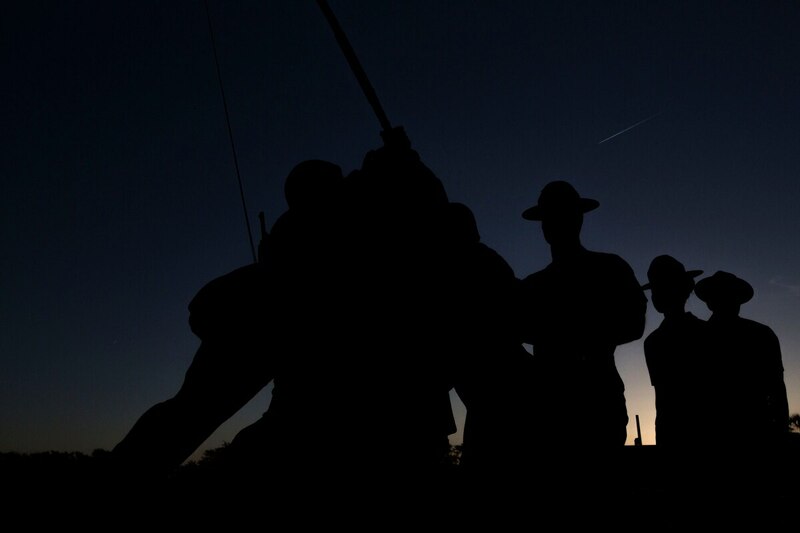 According to Parris Island spokesperson Bobby Yarbrough, warrant officers comprise just about 2 percent of the Marine Corps. And Yarbrough, himself a warrant officer, said there are even fewer CWO4s — only 295 in the roughly 182,000-strong force. That fact, coupled with the rolling monthly promotion schedules, made it even more unlikely that Wes' promotion would coincide with Charlie's graduation from Parris Island. "The short answer," Yarbrough said, "is it's extremely rare." Charlie completed the Crucible — a Parris Island recruit's final test — on Sept. 22, receiving his Eagle, Globe and Anchor pin with his comrades in Platoon 3072 and becoming a Marine the day before his 18th birthday. On Thursday, Oct. 4's Family Day, the day before he graduated boot camp, Charlie and his grandfather, Jack Guarino — himself a 1961 Parris Island graduate and Vietnam-era Marine Corps Reservist — pinned on Wes' upgraded insignia. The three men posed for a picture at the depot in front of a statue commemorating the World War II Iwo Jima flag-raising. It was the first time Charlie and Jack had seen Wes promoted. Maureen, who met her 41-year-old husband when he was corporal, said it was hard to send her child to boot camp. He was the kid that "held her hand" when the family — including Charlie's three siblings — had to watch Wes leave for duty. Charlie was her "rock," she said, when her husband was in harm's way. Charlie said his dad thanked Maureen after the promotion ceremony, which meant a lot to him. Over the years, he's seen the toll military life can take on marriages — "a lot" of his friends' parents have divorced, he said. Maureen says her family tries to keep a sense of humor. Their tongue-in-cheek motto is, "It can always get worse," and the Guarinos shy away from being thanked for their service or otherwise praised. The deployments and the cross-country moves are their "normal," she said. It's the life they know. Like his grandfather, Pvt. Charlie Guarino will be a Reservist. Once he finishes Marine Combat Training at Camp Geiger, N.C., and his military job training course, he'll look to enroll in college and work toward becoming an officer and a helicopter pilot. As for Wes, he now knows how his father felt when the elder Guarino told him goodbye before boot camp. Jack, 74, told the newspapers that, after the recruiter picked up his son in 1995, he'd driven to the nearby hotel where then 17-year-old Wes was staying before leaving for Parris Island. He wanted to see the boy one last time, he said.